"Addressing the need for research-based vocabulary intervention", with public schools moving toward a Common Core Curriculum, SLP's have to keep up with our Evidence Based Practice (EBP). Everything we do in therapy should be backed up by evidence (research). Evidence, evidence, evidence, which finding can be time consuming. This book does it for you. 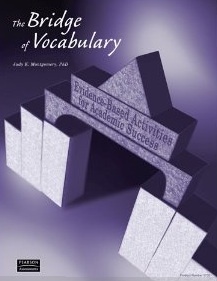 Each lesson has a note about the evidence behind why it works to improve vocab skills. Addresses semantic (vocabulary) skills ages Preschool through Adults! Target speaking, listening, reading, writing, nouns, verbs, antonyms, synonyms, categorization and more! Specific lessons, with script, picture cards ready for lessons in vocabulary. Comes with a CD to print all lessons. Why only 3 crowns? Remember that CD I just told you about? It takes forever to print out and get each lesson set up. I finally have all mine set-up and I have owned the book for well over a year. The book only gives you examples, the CD has everything you need on it. Then you have to find a way to organize it all...I will post about that later. The opinions expressed in this review are mine. No other compensation was provided.